"Steak served with a sophisticated but easy pan sauce of shiitake mushrooms, tarragon, white wine, shallot, and butter. Impress your sweetheart with this dish!" 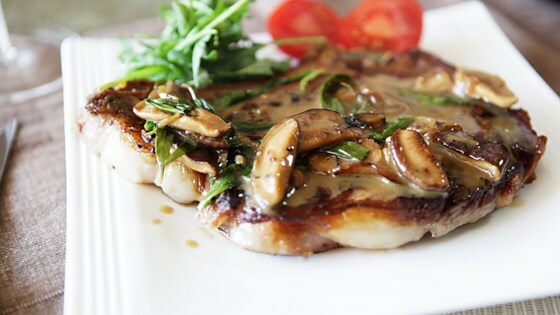 Learn how to cook a perfect steak with mushroom sauce. The taste was quite interesting, served it with mashed potatoes. This was a great recipe. My husband loved it. Will definitely make it again! No changes made to the recipe and I will make it again. That's a rib steak. not sirloin,lots difference in taste and tenderness.